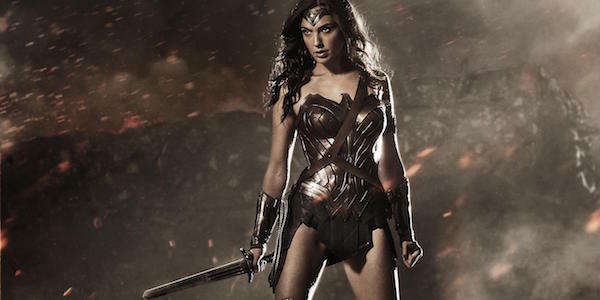 Wonder Woman already boasts many special Amazonian abilities, but in Batman v Superman: Dawn of Justice, she dove into battle wielding a sword, just like her New 52 counterpart. The blade came in handy going up against Doomsday, but it was more than just a mere weapon. While this couldn’t have been read in the midst of the blockbuster’s action, the sword also had some writing on it, specifically from author and mythologist Joseph Campbell. Life is killing all the time and so the goddess kills herself in the sacrifice of her own animal. Given that Diana comes from an island populated with female warriors, this survival of the fittest-type quote is especially fitting for her sword. Joseph Campbell also wrote "The Hero with a Thousand Faces" in the 1940s, so for one of his quotes to be inscribed on the weapon wielded by one of the world’s most popular superheroes is a cool way to pay homage to his work. Also imprinted on the sword was an eagle, which Zack Snyder added because the bird has been her motif for decades. Next year, Wonder Woman is going back in time to show moviegoers what Diana’s life was like on Themyscira and how her journey through the outside world in World War I went. Footage from The CW’s DC Films Presents: Dawn of the Justice League showed Wonder Woman wielding her sword and shield in early 20th century Europe, so presumably we’ll see in the movie how she obtained these weapons on Themyscira before departing. That said, if Diana’s mother, Hippolyta, or one of the other Amazons translates what’s written on the sword, it will likely be something different than the Campbell quote. Otherwise, we’ll start wondering if Campbell crossed paths with an Amazon at some point…well, I will, anyway. Just like in the comics, Gal Gadot’s Wonder Woman grew up on Themyscira, surrounded only by other Amazons and unfamiliar with what the rest of Earth was like beyond the island’s shores. Wonder Woman will explore these Amazonian origins and her adventure in World War I, while Batman v Superman: Dawn of Justice caught up with her 100 years later, at a time when she barely wanted to be involved with “man’s world.” However, following the battle with Doomsday, Diana seems game for joining the Justice League, so it won’t be long before she’s using that sword against another villain threatening the planet. If you haven’t already, you can check out Wonder Woman wielding her sword in theaters in Batman v Superman: Dawn of Justice, while her solo movie will arrive on June 2, 2017.